Pizza calories can be cut down easily by choosing the right crust and toppings. Try these tricks to reduce calories while retaining sumptuous flavor! Most of us don't really want to know the truth when it comes to our voluminous consumption of pizza!! Yet, there is a healthy amount of us who do want to enjoy our beloved pies while counting fat and calories. While pizza is not typically considered a low calorie food, there are ways to make it a healthy choice. First trick, as with any food, is to watch portion size. Easier said than done, right? I know, believe me. But to keep a handle on those calories, it's essential to keep your serving size to one or two slices of pizza. I know you can do it! Try using a whole wheat pizza dough instead of a white crust. Thin crust pizza, depending on how it's made, can save you calories. Use turkey sausage, grilled chicken and lean meat instead of fatty meats. Bulk up on the veggies to make your pizza more filling with fewer calories. There's a reason most veggies have zero Weight Watcher points! Dab the grease off your pizza with a paper towel. Soak up a few extra calories! You won't miss the grease, I promise you. Remember, pizza is not the enemy. By all means go out and enjoy it! But keep in mind it's all about choosing the right crust, right toppings and keeping your portion size to one or two slices. The type of crust you choose has a big impact on calories when dining out or ordering pizza. 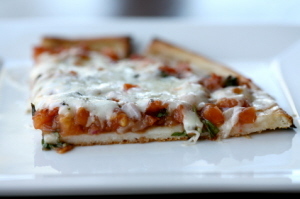 You save anywhere from 20 to 80 calories per slice just by choosing a thin crust. Pizza Hut calories go up by a whopping 100 per slice on a deep dish pizza as opposed to a thin slice. Little Caesars only has one crust option besides the Deep Dish. Their crust probably isn't as thin as the other "thin crust" pizzas. Oddly enough, Papa John's thin crust cheese pizza has more fat than the original crust. Frozen pizza calories can be just as ominous as delivery pizza. The good news is, many brands do have options for those watching their fat and calorie intake, as well as organic and vegan options. You can find great healthy choices in the frozen pizza case at the store. Again, look for crusts that are thin, whole wheat or flatbread. Choose veggie toppings and try not to eat the whole pizza (believe me, I know how hard that is!). Making your pizza at home is often the best bet for healthy and low calorie because you control the ingredients. There are so many great homemade pizza recipes that can help you, too. Crust options can range from a great, thin crust pizza dough or whole wheat pizza dough to an easy Boboli pizza crust or other ready-made thin crusts. Remember to choose toppings wisely. Use fresh veggies like green peppers and olives instead of loading up on pepperoni and sausage. So, you see? You can cut down on pizza calories easily and still enjoy the flavor of a great pie!